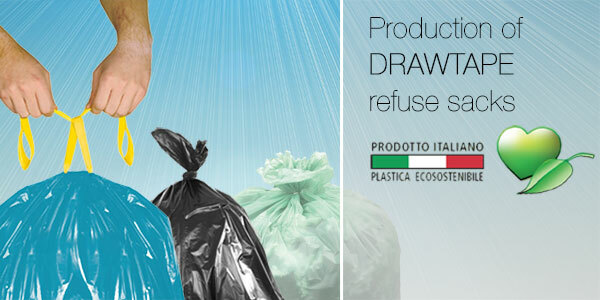 Garbage bags line with handy and strong yellow drawtapes, produced with 100% recycled polyethylene that allows to manufacture an environment- and eco-friendly bag in respect to the nature. 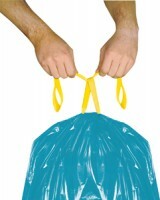 The widest range of tailor-made drawtape refuse sacks on the market that reduces the use of plastic thanks to the variety of sizes and thicknesses (from the thin to the extra strong bags) suitable for plenty of uses: home and office, separated and general waste collection. The drawtape closing device offers some advantages as far as hygiene and comfort concerns. All our drawtape bags are on a roll and packed under high definition printed paper band where you can find all the information about the bag and the corresponding container. According to LD. 196/2003 laying down rules for the protection of persons and other subjects regarding the processing of personal data, data entered in the panel will be used for purposes connected with the business. Data will not be in any way transferred to third parties without explicit authorization and will later be used only for purposes strictly related to services provided or sales promotions.